What causes hypothyroidism? Is it inherited? Is it the result of a nutritional deficiency? Please see Iodine deficiency page. A. Hypothyroidism is sometimes referred to as "underactive thyroid." 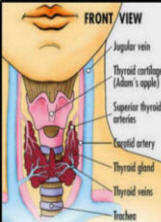 Your thyroid is a small gland at the base of your neck that has a big impact on how your body works. The hormones your thyroid produces help regulate your metabolism, including how efficiently you burn calories and maintain your body temperature and heart rate. According to a new study by doctors based in Sweden, people with celiac disease face a significantly higher risk of developing thyroid disorders, including hypothyroidism, hyperthyroidism and thyroiditis. I'm sure you know this. What you may not know is that excessive intake of fluoride, in water, bottled drinks, foods, and toothpaste, will reduce the biologically active iodine in your system, and cause iodine deficiency: another name for hypothyroidism. No one ever heard of hypothyroidism until America began to fluoridate its municipal water supplies in the late 1940s. Most auto-immune diseases didn't exist before 1950 either. Nor did Alzheimer's disease. Most people don't know that the pituitary gland in our brain, is the master gland that controls the effective functioning of all the other glands. Unfortunately, the pituitary gland soaks up fluoride like a sponge. And when that happens, the pituitary gland stops secreting a hormone known as TSH that stimulates the thyroid gland. At that point, hypothyroidism is inevitable. When your thyroid doesn't make enough of two hormones -- triiodothyronine (T-3) and thyroxine (T-4) -- hypothyroidism results and your metabolism slows. This can lead to sluggishness, weight gain, dry skin and hair, a hoarse voice and increased sensitivity to cold. Left untreated, hypothyroidism can lead to potentially serious complications, including high cholesterol levels and heart disease, such as congestive heart failure. The thyroid's production of T-3 and T-4 is governed by two other parts of your body: the pituitary gland and the hypothalamus. Your pituitary gland is the master gland that controls all the other glands in your body's hormone-producing (endocrine) system. Through its production of thyroid-stimulating hormone (TSH), the pituitary tells the thyroid how much T-3 and T-4 to make. One of the jobs of the hypothalamus -- the part of your brain that controls the entire endocrine system -- is to signal to the pituitary gland how much TSH to make by secreting another hormone: thyrotropin-releasing hormone (TRH). Although a defect anywhere in the hypothalamus, pituitary or thyroid can lead to hypothyroidism, most problems that trigger the condition directly affect the thyroid. It's rare for a decrease of TSH from the pituitary gland or decreased secretion of TRH from the hypothalamus to cause hypothyroidism. In regard to your question about whether hypothyroidism is inherited, thyroid disorders do tend to run in families, but the inherited form of hypothyroidism is rare.